Matt is the Vice President of the corporation. He is responsible for Vinyl rail and fence sales. He schedules all vinyl rails and fence installation as well as doing some installation himself. He helps with estimating screen rooms and sunrooms, vinyl siding, windows and garage doors. 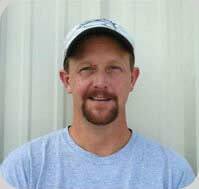 Matt has a certificate of Master Craftsman in vinyl siding as well as having his Builders License. Matt also oversees fabrication, and running the equipment that manufactures the fence components. Matt has spent his entire life in the construction business. As a child he would spend hours on construction sites helping build new homes and remodel existing ones. When he was not building houses he was helping papa install fence materials. In his off time, Matt enjoys hunting and fishing along with taking care of his many aquariums of tropical fish and his Great Danes.